Tickets for Marty's Late Night Jam to take place Wednesday, June 8 at the Ryman Auditorium, go on sale Friday, April 8 at 10 a.m. (CDT) through Ticketmaster. Tickets are $35 and $45 plus service fees. Marty and His Fabulous Superlatives performed "Stop The World (And Let Me Off)," "La Tingo Tango," and "There's A Rainbow (At The End Of Every Storm) on the Friday, January 1 Grand Ole Opry. Marty and His Fabulous Superlatives performed "Tear The Woodpile Down" and "Long Black Veil" on the first show of the Friday, November 21 Grand Ole Opry. On the second show, they performed "The Whiskey Ain't Workin'" and "El Paso." Marty and His Fabulous Superlatives performed "Bridge Washed Out," "Mandolin Rip," and "Chris Scruggs' Boogie" on the Friday, October 9 Grand Ole Opry. Marty and His Fabulous Superlatives performed "Orange Blossom Special," "Tempted," and "Apache" on the first show on the Tuesday, October 6 Grand Ole Opry. On the second show, they performed "Tear The Woodpile Down," "Pretty Boy Floyd," and "Life Has Its Ups And Downs." Thanks to Chris Schimmel for the second show songs. Marty and His Fabulous Superlatives and Connie Smith performed in Gulfport Mississippi on August 28 at the 10th anniversary of Hurricane Katrina remembrance event for the first responders, which was also attended by former President George W. Bush. On Saturday, August 8, Marty and His Fabulous Superlatives helped Connie Smith celebrate her 50th anniversary as a member of the Grand Ole Opry. The highlight was having Marty sing "Till I Found You" with Connie joining in on the second verse and Connie singing "You've Got Me (Right Where You Want Me)" which were the songs they sang to each other at their wedding in 1997. Marty and His Fabulous Superlatives performed "Freight Train Boogie," new Superlative Chris Scruggs performed "Old Souls Like You And Me" and the band closed with "Chris Scruggs' Boogie" on the Wednesday, June 17 Grand Ole Opry. Read Late Night Jam recaps from The Tennessean, The Boot, and Country Weekly. The lineup for Marty's 14th Annual Late Night Jam at the Ryman on June 10 included Carl Jackson Orthophonic Orchestra, Charley Pride, Connie Smith and The Sundowners, EmiSunshine, Eric Church, Jimmy Webb, The Opry Square Dancers, The Bads, Tommy Emmanuel, and the Brothers Osborne. Deepest sympathy is extended to Hilda, Marty, Connie, Jennifer and the rest of their family on the passing of Marty's father, John Stuart, on April 9. Fabulous Superlatives Apostle Paul Martin has left the band and has been replaced by Chris Scruggs. Check out the terrific article on Marty in the February/March issue Garden & Gun magazine. The 2014 Nashville Scene Country Music Critics Poll appeared in their January 22 issue. The album, Saturday Night / Sunday Morning came in at #14. Under Life Acts, Marty and His Fabulous Superlatives came in at #6. Under Duos and Groups, they came in at #7. Marty's mom, Hilda, has released a book of her photographs called Choctaw Gardens. The book features photographs of Hilda's early life as well as family photographs she has taken over the years, especially chronicling Marty's rise to fame. The book is available through Amazon and Nautilus Publishing for $38. Be sure to "like" her Facebook page. 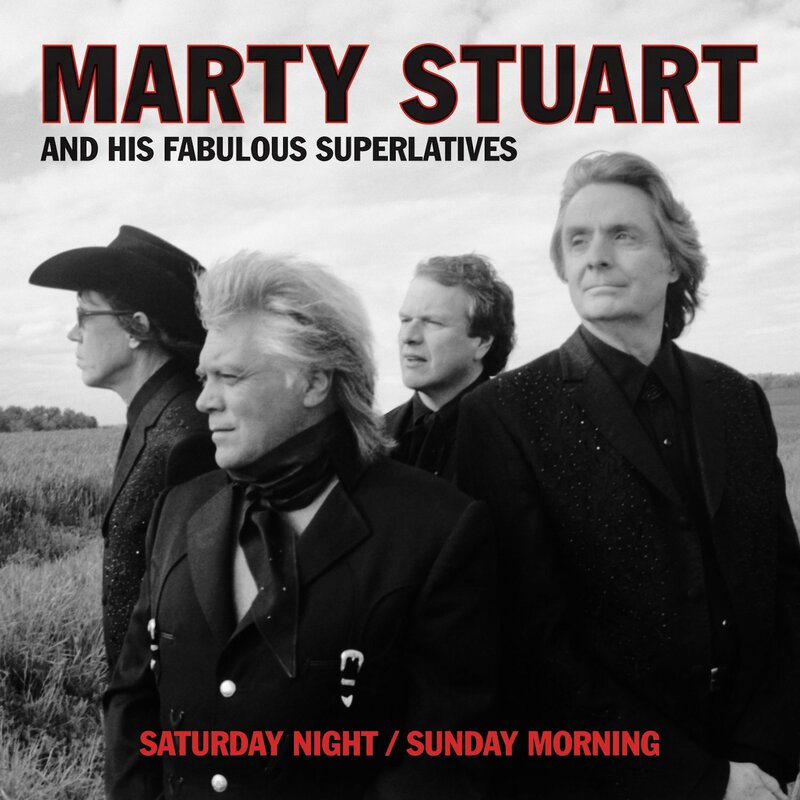 by Marty Stuart, or Marty Stuart Tours, Inc. This is a fan site created and maintained by a fan.